At least 30 states and the District of Columbia now have laws broadly legalizing marijuana in some form. Apart from those states which allow recreational use, most require a doctor’s permission to legally acquire, possess and use medical marijuana. Visit the National Conference of State Legislatures to find which states have medical marijuana programs. Over the past two decades, the attitudes and laws in the United States have become more tolerant towards marijuana, with the proportion of adults using the substance doubling between 2001 and 2013. Except in a few special medical circumstances, doctors face both ethical and legal consideration in deciding whether to prescribe or recommend a drug that is legal in their state but not at the national level—especially as clinical research on the drug’s efficacy is still limited. What types of conditions can medical marijuana treat? The FDA notes there is considerable interest in (as well as clinical research to support) the use of marijuana to attempt to treat certain medical conditions, including but not limited to glaucoma, cancer, multiple sclerosis, chemotherapy-induced nausea, and certain seizure disorders. This is in addition to treatment for chronic pain and the effects of post-traumatic stress disorder and traumatic brain injury. What are other possible benefits? Advocates believe that legal access to medical cannabis could potentially alleviate the opioid addiction crisis that has been reported among veterans. Some data suggests opioid prescriptions peaked nationally in 2012 and have declined since, while overdose deaths have only continued to rise since then. A 2017 report from the National Center for Health Statistics states the national opioid crisis resulted in the death of more than 42,000 Americans in 2016. The reason for this, according to a landmark 2016 surgeon general’s report: Addiction has nothing to do with supply—hence the corresponding explosion in overdoses from heroin and deadly fentanyl in the last decade, despite fluctuations in opioid prescription misuse. Alarmingly, a 2013 analysis by the Center for Investigative Reporting found opioid prescriptions for veterans spiked 270 percent over a 12-year period from 2001 to 2012, while a 2011 Department of Veterans Affairs study found that during 2004 and 2005, veterans receiving the highest doses of opioid painkillers were twice as likely than the rest of the population to die from an opioid overdose. According to USA Today, almost every VA facility has experienced a steady drop in its opioid prescription rates since 2012, with an overall decline of 41 percent. The VA is continuing its efforts to promote safe prescribing practices and to address the broader opioid epidemic in the United States, which includes alternative therapies for its patients. Are there efforts underway to legalize medical cannabis for veterans within VA? VA scientists are able to conduct research on marijuana benefits and risks, and potential for abuse, under regulatory approval. Any questions related to research can be addressed to VHABLRD-CSRD@va.gov. H.R. 5520, the VA Medicinal Cannabis Research Act of 2018, which DAV supports and has bicameral support in the Senate—would promote scientific and medical research into the safety and efficacy of medicinal cannabis usage for veterans diagnosed with PTSD, TBIs, chronic pain and other illnesses and injuries by clarifying that research into medicinal cannabis is well within the authority of the VA.
What is DAV’s stance on medical cannabis for veterans? DAV Resolution 023, passed by DAV members in 2018, calls for research into the medical efficacy of medical cannabis for treating conditions of service-disabled veterans. 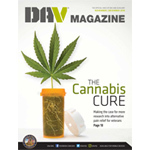 Additionally, as mentioned above, DAV supports the VA Medicinal Cannabis Research Act of 2018 which seeks to do this. This is an important issue for many disabled veterans and DAV members—and leadership believe it is critical to enhance the base of knowledge surrounding the potential benefits and risks. Can veterans get medical marijuana through the VA? While the VA cannot deny veterans access to health care or compensation benefits due to medical marijuana use, its providers are prohibited, by law, to recommend or prescribe cannabis as the Food and Drug Administration (FDA) still classifies it as Schedule 1 drug. VA providers may only prescribe medications approved by the FDA. VA policy indicates participation in state marijuana programs does not affect eligibility for VA care and services, and VA providers are able to discuss cannabis use with veteran patients and adjust care and treatment plans as needed. Veterans are encouraged to discuss medical marijuana use with their VA providers as part of their confidential medical record. The VA will not pay for medical marijuana prescriptions from any source, nor will VA providers complete paperwork or forms required for a veteran to participate in a state-approved marijuana program. Additionally, the use or possession of marijuana is prohibited at all VA medical centers, locations and grounds—even in states in which marijuana use is legal. However, anecdotal feedback from veterans shows that VA’s directives and actual patient experiences sometimes differ in cases where a prescribed medical marijuana user walks into a federal (VA) facility. View VA’s full directive on medical marijuana here. If you have questions regarding this policy please contact population.health@va.gov. Is it true that I could lose the right to buy or own firearms if I use medical cannabis? Marijuana, despite medical and recreational legalization in some states, is still illegal under federal law. Some states have remedial steps to restore 2nd Amendment rights for registered medical marijuana users. But it is important to remember that even in states where it is legal, the federal law still applies. What resources are available to learn more?